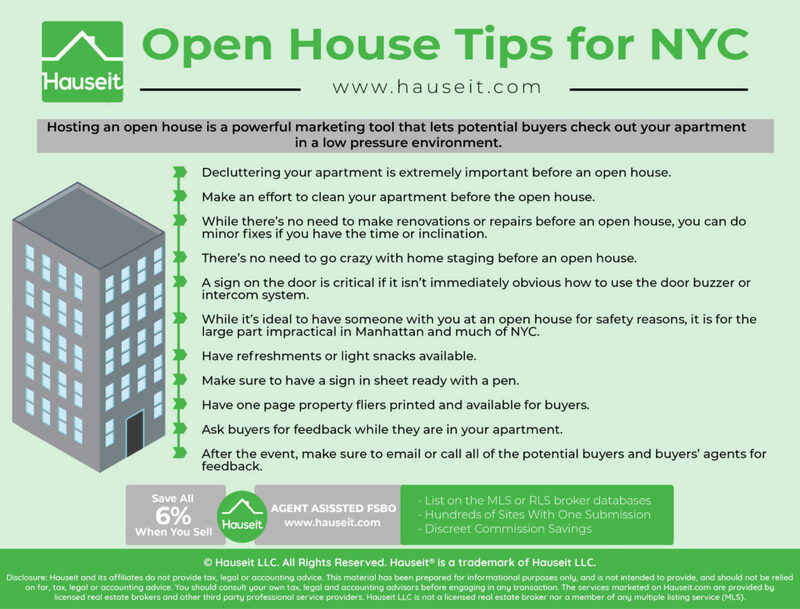 We’ll teach you everything you need to know about holding an open house in NYC in this article, from industry secret open house tips to how to do an open house For Sale By Owner. An open house is a block of time when a property for sale is available for viewings on a walk-in basis to the general public. An open house typically lasts one to three hours, and is usually hosted on a weekend afternoon. During the open house, the seller or the listing agent will be present at all times. This means potential buyers do not need to make an appointment to stop by, and buyers are welcome to come by anytime during the duration of the open house. New York City is unique in that some buildings, especially coops with stricter house rules, will not allow open houses. Others will only allow open houses if there are at least two agents present, including an agent who escorts buyers from the lobby to the apartment. Some co op apartment buildings will allow open houses by appointment only, and some will have no rules or prohibitions against hosting open houses altogether. 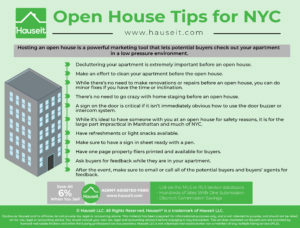 Open house tips: Learn what an open house by appointment only is by reading our article on this very unique NYC phenomenon. It’s a great idea to post open houses by appointment only even if you do not plan to host a regular open house because it’s a signal to buyers that your place is still available. Furthermore, you only have to show up if a buyer requests an appointment. A broker open house is an open house that is posted only in the MLS and marked as an event for brokers only. Because a broker open house is not publicly posted on consumer property search websites, only brokers will know about the event and show up. A broker open house is usually posted during the middle of a weekday when Realtors are free and do not have showings or open houses of their own to host. A broker open house is one of the most common open house ideas for struggling sellers of higher priced luxury homes in NYC. Hosting a broker open house is also one of the most common open house tips that real estate listing agents tell developers. This is because buyers’ agents play an even more prominent role for sales of luxury listings versus more plebeian listings. As you’ve heard before, over 90% of all home buyers are represented in NYC. The proportion of buyers who are represented increases to almost 100% for luxury real estate listings in NYC, defined as properties selling for $10 million or more. As a result, a broker open house is a common open house idea that many sellers and listing agents have for enticing high profile buyers’ agents. Please take a look below at a sample open house invitation email from a listing broker in the West Village, Manhattan, New York City. This listing broker is attempting to set up an open house tour and has emailed other listing brokers with similar properties for sale in the area to coordinate. We would like to host a broker open house tour next Tuesday, Mar 5th from 11:00AM – 12:30PM. We hope you’ll join. We will also post as a public open house as buyers are welcome and hope that you all would do the same. Please let us know ASAP so we can put together and finalize the tour. Thank you. Open house tips: If you’re going to host a broker open house, why not just make it a public open house as well? This is exactly what the broker above had in mind and it’s a very logical idea. Why would you turn down the option value of having direct, walk-in buyers? Since you’re going to be there to host anyway, why not make it a public open house? The first step to hosting an open house in NYC is to determine a time and date where you will positively be free. One of the worst things you can do is to post an open house and then forget about it or cancel it at the last minute. That will result in many irate buyers and agents showing up to your locked door. That’s a great way to piss off a great deal of people and receive many phone calls and email messages from some very angry New Yorkers. Open house tips: Make sure to choose an open house date that’s at least three days away before posting it. Ideally, you’ll post an open house 6 days before the event. You don’t want to post it too far in advance so buyers won’t accidentally think it’s this Sunday versus next Sunday. If you’ve purchased a List Your Home Online listing package, you can easily submit your listing update for the open house in just one place, and our partner brokers will automatically syndicate your listing to the MLS and associated property search websites (i.e. NY Times, Zillow, Realtor.com, StreetEasy etc.). As we’ve discussed above, do not wait until the last minute to do this. You’ll want to give adequate time for the market to notice your open house. Furthermore, please allow up to one business day for our partner brokers to make the update. 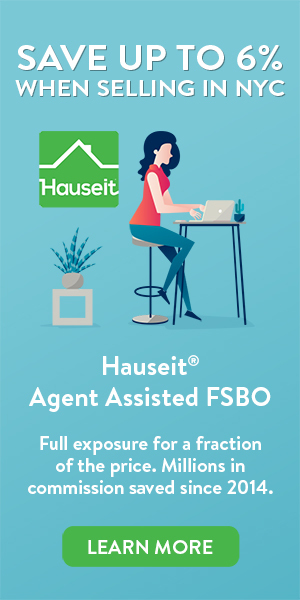 Agent Assisted FSBO sellers have the option of having their open house professionally managed by one of our partner agents free of charge. You should consider this option if you’re shy or uncomfortable with showing your own home. Furthermore, if buyers recognize that you’re the seller, they may feel less comfortable with inspecting and commenting on the property. No one likes a seller that is “hovering” over them during an apartment viewing. Once you’ve decided on when the open house will be, who will be hosting it and have posted the open house online, it’s time to prep your home for the event. Please read our open house tips and open house ideas in the next section! Hosting an open house is a powerful marketing tool that lets potential buyers check out your apartment in a low pressure environment. Buyers won’t feel pressured about using your time since you were going to be there anyway for the duration of the event. Furthermore, buyers aren’t expected to qualify or explain themselves to get a private showing since you can simply walk-in to an open house. As a result, remember to take it easy and let buyers browse freely, leave the high pressure sales tactics at work! Decluttering your apartment is extremely important before an open house. Make sure all of your personal items and valuables are safely stored away, preferably in a locked safe. Not only will a decluttered apartment help buyers focus on the property vs your life, you’ll be less likely to have something stolen. Furthermore, you’ll simply be less stressed out if strangers aren’t walking over your personal belongings! Furthermore, you should make an effort to clean your apartment before the open house. If necessary, hire a maid to do this for you. You may also wish to hire someone to clean your windows as well if they’re particularly dirty. Having a clear open view through your windows can increase your sale price substantially. While there’s no need to make renovations or repairs before an open house, you can do minor fixes if you have the time or inclination. While not necessary, you could ask the building superintendent to help put on a new coat of paint if you have chipped or peeling paint on your walls. Or you could pay him a few dollars to help you replace a broken door handle or light bulb. There’s no need to go crazy with home staging before an open house. Renting expensive furniture and hiring an interior decorator is not practicable for most home sellers, unless you are a developer hawking brand new luxury developments. However, there are simple things you can do like lighting candles and removing holiday decorations. Read our tips on how to get your house ready to sell in our Complete Guide to Selling a House in NYC. You should consult your attorney and your building’s condo or co-op bylaws or coop house rules to see if posting signs for your open house is allowed. If so, it’s a good idea to post a sign on the wall of a common area, such as the building’s laundry room, as well as the building’s front door. This is a great way to get additional traffic from your neighbors in the building as well as passersby. Furthermore, a sign on the door is critical if it isn’t immediately obvious how to use the door buzzer or intercom system. Some owners go so far as to post outdoor signs for their open house on the sidewalk. Please consult your local ordinances on whether this is allowed before doing so. While it’s ideal to have someone with you at an open house for safety reasons, it is for the large part impractical in Manhattan and much of NYC. People are busy and time is valuable. It’s wasteful to have an open house double staffed for multiple hours. Furthermore, New York City is consistently ranked these days as the safest big city in the United States. Have refreshments or light snacks available. Buyers will be extremely grateful on a hot day to find complimentary bottles of water at your open house. If they’re hungry, they’ll appreciate that fresh batch of cookies you’ve just baked. Not only will fresh cookies make buyers feel indebted for the free gift (it’s human nature after all), they’ll literally stay around longer and your home will smell better and feel cozier. Are you a stickler for cleanliness and worried about crumbs on the floor? Then skip the cookies and stick to edibles that you can cleanly eat with one bite. Make sure to have a sign in sheet ready with a pen. The sign in sheet simply needs to have room for the buyer’s name, phone number and email address. You don’t want to make it too complicated or time consuming for someone to sign in. Tablet computers are quite popular for open houses as there are many simple apps you can download for free for the sign in process. However, if you go the electronic sign in route, we recommend having a laptop for the purpose. It’s just so much faster and easier for most people to type on a keyboard. Have one page property fliers printed and available for buyers. If you’ve purchase a List Your Home Online listing, our partner broker will provide you with a standard show sheet upon request. The show sheet will have the property description, photos, amenities and key information about the property such as the maintenance and price. One of the best open house tips is to ask buyers for feedback while they are in your apartment. This is a great open house idea because you’ll be more likely to receive a response in person versus emailing for feedback days later. If you do strike up a conversation with a potential buyer, use the opportunity to learn more about how far along they are in their search, and how qualified and serious they are. After the event, make sure to email or call all of the potential buyers and buyers’ agents for feedback and to see whether they’d be interested in making an offer or scheduling a second visit. Don’t be surprised if most of the people do not respond, or that some of the email addresses might be illegible or even fake. Open house tips: Copy our partner broker on follow up emails for enhanced legitimacy if you are an Agent Assisted FSBO seller. Buyers and buyers’ agents will be less confused and won’t have to trouble you to explain the connection between the listing broker and yourself. Open house ideas in NYC can be as varied as the culture and nightlife available in this great city. Open house ideas in NYC will range from your run of the mill event with light snacks and bottled waters to full fledged parties complete with DJ’s, hors d’oeuvres and a guest list. Open house ideas in NYC can even be sponsored by liquor companies and bank lenders if the anticipated guest list is high profile enough, and if the price point of the unit is high enough. After all, if you are selling a luxury home For Sale By Owner in NYC, why not make it an exclusive, invitation only event for all of your celebrity friends? Not only will your home get free press and foot traffic, you’ll help spread the word about your luxurious condo for sale. Alternatively, just order a catered sushi lunch and invite all of the brokers who work in your neighborhood to come by for free food and a tour of your newest listing!